For the first layout this week, Kenny and his team have created an inviting Day Spa Layout Pack. This Layout Pack is sure to attract all those browsing for an exciting escape to a day spa. The design evokes comfort and relaxation with soft colors and striking imagery. Plus, it has everything you need to set up an online spa business, including unique layouts for showcasing services, listing price packages, booking appointments, and more. 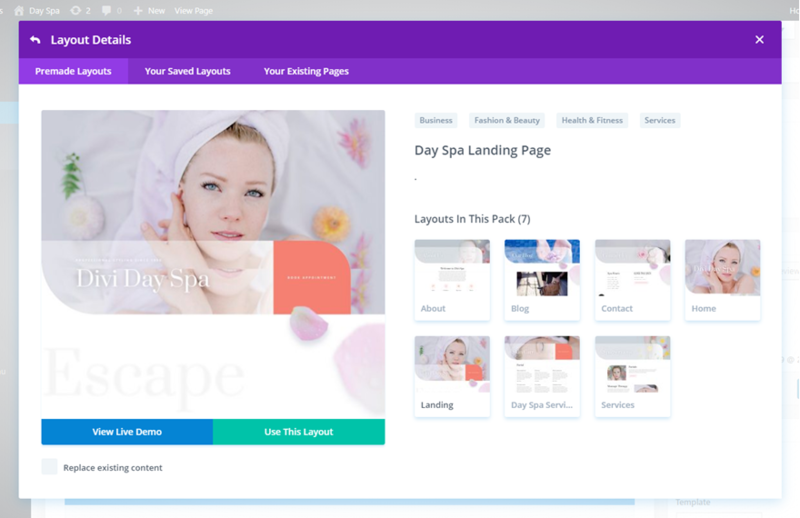 Getting a Day Spa site up and running will be a breeze with this layout pack. 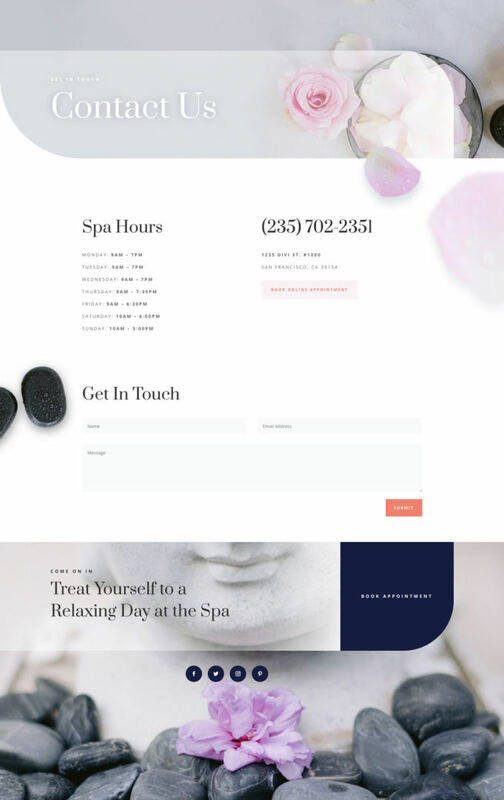 The unique design elements are perfect for a modern day spa website. It has beautifully rounded frames for your content and creative grid layouts for displaying services, spa packages, and various calls to action. The soft color scheme and light background gradients create a heavenly feel that is very pleasing to the eye. 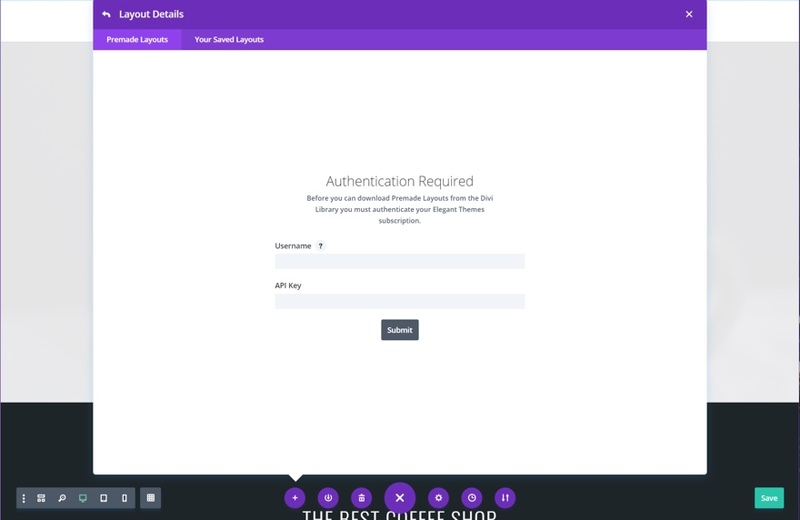 It also has a dedicated services page for displaying all your spa services as well as a page for showcasing a single service. To access your new layout, simply activate the Visual Builder when editing a page and look for the “Load From Library” icon in the page settings bar (it looks like a plus symbol). Click this icon to launch the Load From Library popup. Under the Premade Layouts tab, you can easily find the new layout by scrolling through the list of layout packs. Once you find the Day Spa Layout Pack, click on it. You will see all the individual layouts included in the pack. Select the layout you want for to use and then click the “Use This Layout” button. The post Get a FREE Day Spa Layout Pack for Divi appeared first on Elegant Themes Blog.